GameStop released a press release where they revealed the details for the pre-order bonuses for the North American FIFA 13(FIFA Soccer 13), which is quite similar to the Ultimate Edition in the UK. The people who pre-order a copy will get their game in a steelbook case and will get free gold packs for the next six months for free. FIFA 13 is twentieth game in the FIFA game series. FIFA, according to its name is a soccer video game series being developed by EA Canada and will be published under EA Sports. It is set to release on 25th September, 2012 in North America and 28th September, 2012 in Europe, on all major consoles, handhelds, Windows and Mac. The Pre-Order bonus from GameStop features the consumer getting their game disk in a steelbook case which features, (probably) the greatest soccer athlete in this era, Lionel Messi on its cover. Apart from the steel cover, you will receive one gold pack per week for the next 24 weeks of your purchase. Each gold pack will consist of 12 items; including players with overalls 75 and up, staffs, badges, stadiums, contracts and some “rare” items. 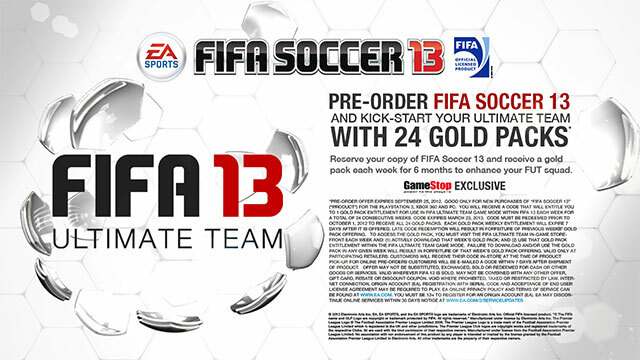 These gold packs are supposed to be used in FIFA 13’s online mode, FIFA’s Ultimate Team. If you are a fan of the FIFA series and plan on making the most out of FIFA’s online mode, I suggest you get hold of this pre-order before they run out. Take advantage with your gold packs in FIFA’s Ultimate Team mode and create your dream team before anyone else does.